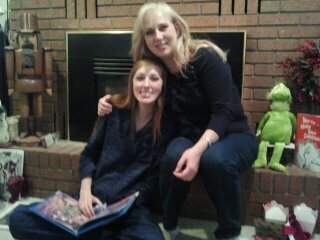 We had a wonderful Christmas Eve. While I was still in denial that it was already Christmas, we spent the morning relaxing, took a spin at the gym (a preemptive act knowing we would eat plenty over the weekend) and a last minute stop to Target to tie up loose ends. Christmas Eve at my home is all about traditions. It is very special to me and I long for the comfort that it brings. We eat Chicken Royale, a chicken dish with ham, stuffing and a mushroom cream sauce. Korianne provided Christmas Jell-o which is a a three-layer gelatin in Christmas colors. Yum. 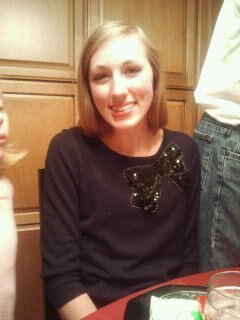 Cute Stacie wearing her Christmas sweater. 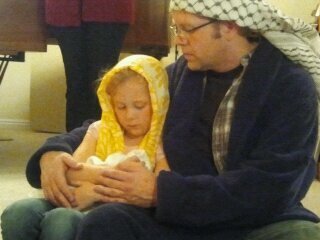 After dinner we reenact the nativity. Bath robes and scarfs are the costumes for almost every character. Reagan is always the most tender Mary. She gazes lovingly at her Baby Jesus and holds him close, even after the pageant is over. Sisters: Korianne/narrator/angel, Malorie, me and Stacie as the wisemen. Minus dad who was behind the camera this year. And who also incidentally missed his entire scene as the donkey. After the pageant I got to snuggle with one of my favorite little people. Malorie and Stacie entertained us with a rousing rendition of Feliz Navidad. If only Charlie's Angels used guitars and tambourines as weapons of choice. The family band entertained the rest of us with some Christmas songs. Santa knew we didn't need anymore jammies for Christmas Eve so he surprised everyone with subscriptions to our favorite magazines. (How did he know?!) Kiki and I got twinner gifts. We were blessed to have Christmas on a Sunday. I could not think of a better way to celebrate our Savior's birth. Luckily, it was my mom's choir Christmas program and I loved celebrating Christmas with music. Since church was at 9 a.m., and we didn't have any kids at the house, we postponed the usual festivities until after church was over. We came home, switched back into our jammies, and ate breakfast, my favorite meal of the entire year. Then we called video-chated my aunt in Greece. And then we were finally sequestered back upstairs while we waited for mom and dad to put out the presents. 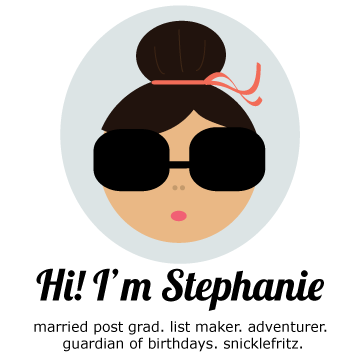 So in all actuality, present opening did not start until after noon. Here we are so sleepy because we stayed up late the night before doing a puzzle. Super-duper excited for Christmas morning. Mom, the present czar, sitting in a pile of presents. Moo wearing the cute ear warmer I made for her stocking. Mom crying when she opened a gift from my dad: Neil Diamond tickets. She claims Neil was her first love. The day moved by so quickly, as the best days usually do. After winding down from the day we watched "A Christmas Story" on TBS (where else?). That movie makes me laugh so hard I want to cry. 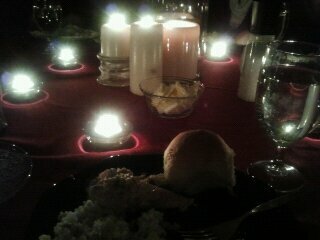 We had just enough time to run home, shower and heat up our soup for dinner with the Bensons. 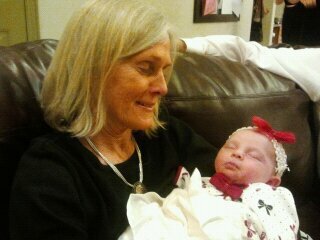 Aunt RoseAnn with the newest Benson addition, Ivy Rose. 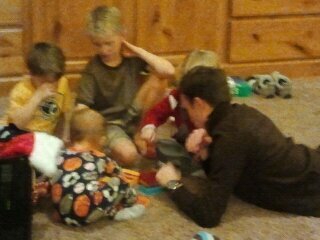 Jacob teaching the kids to play a game. 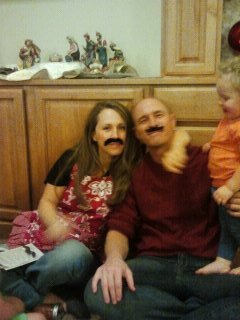 In addition to a real gift we gave the Bensons, we included a little treat: stick-on mustaches of course. And everyone got in on the fun. Excuse me. I mustache you a question. I'd love to stay and chat, but I really mustache. I must say...you guys look really good with mustaches!